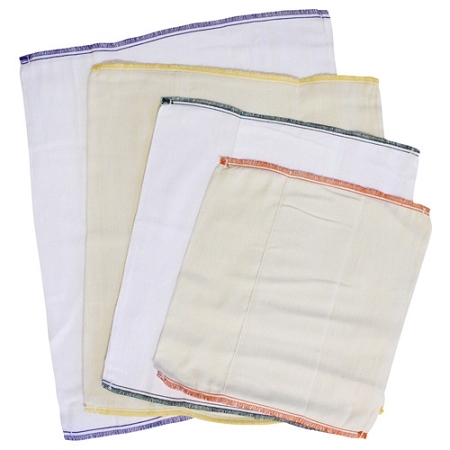 Prefold nappies are a hard wearing economical cloth nappy system, although they are sized you don't need to buy every size, imagine prefolds are available as unbleached, white bleached or bamboo, the favourate here are the bamboo followed by the unbleached as these stay softer then the bleached white prefolds. Imagine prefolds are smart fit meaning they are shorter and wider then normal prefolds therefore they are easily folded in 3 and placed in a wrap for fast nappy changes, if you want to be able to fold the prefold and fasten with pin or nappi nippa you will probally need to size up. 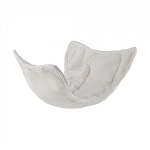 i'm in love with the absorbancy of these prefolds they are amazing and last for hours with my heavy wetter! prepping took 1/2 hour stove top boiling and 5 hot wash and dry cycles. this made them quilt up, but i think they will quilt up more the more i use them. They do pill a little bit but nothing to moan about. size medium fits easily into a flip cover. 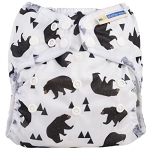 these prefolds absorb/ catch breastfed poo so well! it just clings on and doesnt seem to explode out the sides, better than my mio prefolds, they are softer too. they are super thick and cushiony so will give a little bubble bum but not too bad as they have several sizes available. i can snappi these around my daughter but they are designed to be pad folded as they are made shorter to fit easily into covers. highly recommend these prefolds they are so cheap and work a treat! I bought the smalls for my newborn stash and I am so happy with these that I just bought the next size up to use when he is bigger. They need a bit of prepping, I boiled them and then washed them a couple of times but they are nice and soft, even when they are line dried. And they are super absorbent. 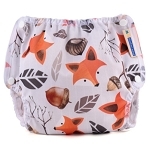 I do find that using them padfolded is easiest altough it does not contain breastmilk poo very well so you will need to change the covers every time he poops. Using a snappi to close them works way better for containment although that needs some practise and I prefer to fold them against the seems since they are a bit wider then, Smalls worked great on my 3,8 kilo newborn. A bit bulky and needs some folding down at the front to get a lower rise but I would recommend that size. I got the large bamboo prefolds and I'm very pleased with them. 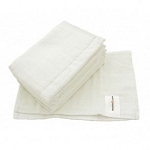 They are much softer than the bambino mio prefolds I was using and much wider which makes them easier to fold around the baby. It's very hard to find good prefolds in the UK so I'm glad FMP stock these. 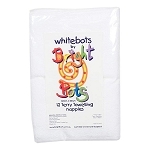 I initially bought these as part of my newborn stash and recently bought some more for my heavy wetting 7 week old as they are really absorbent. We use them padfolded in our thirsties duo wraps, best bottom wraps and they just squeeze into our size 1 capri covers on the largest setting.